So who’s looking for a dope old school style female emcee? 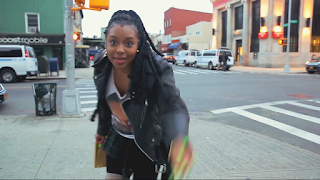 Well if you ar,e New York native Latasha Alcindor aka” LA” is your girl. Her newly released video HeadRaps is short and sweet, but gives the world a statement to who she is. She uses her hometown of Brooklyn as a backdrop in the video, as she raps through the streets with her library book and over the shoulder messenger bag. It makes her even more real. This combined with her poetic justice braids, oversized varsity jacket and hype man in the back just screams 90s hip hop, and I love it. But it’s not a gimmick. Her style may be old school but her lyrics are current, spitting metaphysical bars about Twitter followers and things of that nature. Her flow is nostalgic and fun and her confidence is intoxicating. This girl is going to rise to the top, and fast. So be on the look out for more of LA’s stuff. HeadRaps - Latasha Alcindor aka L.A. from Latasha Alcindor aka L.A. on Vimeo.